Se7enT is a decentralized package delivery system on top of the SixT Car rental/sharing service. Though private modes of transport are convenient and need low investment compared to public modes of transport, it is usually discouraged due to the higher energy consumed per passenger thus making it detrimental to the environment. Our idea today is to make the private modes of transport efficient to the maximum possible extent where all the resources are optimally consumed. 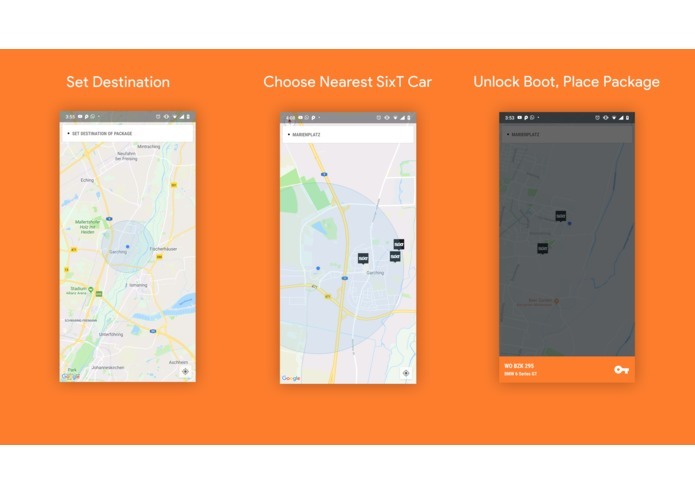 SixT has already taken the right step in this direction by not only providing services for Car Rentals, but also encouraging their customers to "Get A Ride", which facilitates car pooling. We have gone a step further with this idea and are ambitiously looking to optimize the boot space of these rentals too, and use them essentially to deliver packages of reasonable sizes from one location to another, without interrupting the customer's riding experience. If a customer is looking to deliver a package from one location to another with extremely reasonable pricing in comparison to most of the delivery services in the market, "Se7enT" is their best bet! Se7enT provides a service where the customer needs to go to the nearest convenient SixT station and unlock the boot of the car and place their package in it. And relax, while se7enT does all the hard work! The customers would be asked to inform while booking their car rental if they would need the boot space or not. The requests for vehicles without the boot space requirement only would be used for se7enT and such customers have lucrative discounts on their next rides. SevenT makes use of the same baseline technology used in SixT. The Android app is written in Kotlin makes use of the Google Maps API integrated with a firebase back-end to showcase a functional prototype of our product. Lack of test data The use case we have chosen to achieve a higher degree of seamless mobility is tricky to test, and requires physical presence for some of the steps. Adapting to the new tech stack Firebase was chosen for its flexibility in providing us with a real-time database which did not need any special setup as the framework had a one stop solution for managing everything related to the backend of our implementation. Worked in mini teams to take ownership of the Android, Database and Service modules helped in speeding up the development to a certain extent Learnt there is a scope for improvement while planning a development road map.